The first statewide straw ban has arrived, folks. And—you guessed it—California is where it’s at. Governor Jerry Brown does not shy away from making his state first when it comes to environmental actions. That’s why he signed A.B. 1884, a bill that stops automatic service of straws at restaurants, on Thursday. It’s the kind of thing more states need to get serious about if they want to save the planet. The ban isn’t a complete elimination of straws. For one it doesn’t include fast-food joints; it’s only for restaurants where a host seats you and a waiter takes your order. What it means is that anyone who wants a straw at a full-service restaurant now has to ask for it. If a restaurant violates this law, which goes into effect next year, they’ll face fines ranging from $25 to $300. The hope is that more people will realize that they actually don’t need a straw to drink their drink, while the people who do need one—like those with disabilities—don’t have to feel like a burden for requesting one. Straws are just one part of the torrent of plastic waste that has infiltrated our oceans, skies, and potentially even our bodies. A study out earlier this week found that mosquitoes may be helping spread plastics through our ecosystem by accumulating them as waterborne larvae. All plastics are harmful to marine life that might mistake the waste for food. Filling their bodies with this gunk, animals sometimes avoid eating actual food, and they starve. As for straws, in particular, the most extreme example is probably when a video began circulating in 2015 of a straw found stuck in the nostril of a sea turtle. Since then, the bans have kept rolling: on plastic cups and plates in France, then plastic bags in California, and eventually a series of straw bans in U.S. cities. Seattle became the first major city in the U.S. to take such action in July. Then, Starbucks and Disney World hopped on the bandwagon. 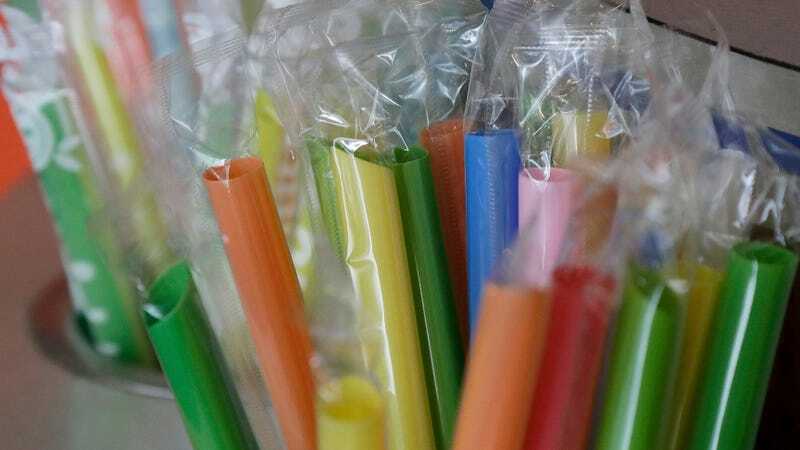 These straw bans certainly make a statement, but government leaders must also keep in mind that straws contribute minimally to ocean pollution in comparison to other waste like, say, fishing gear or balloons. In fact, these two items, along with plastic bags, are what marine researchers are really worried about. California’s already handled plastic bags, but what about fishing gear and balloons? Maybe those should be the state’s next priorities. Balloons Are Bad—Should We Ban Them?